FROM NORTH: Take I-70 to exit 41. Turn South on US-231. -- FROM SOUTH: Take I-64 to exit 57. Turn North on US-231. -- ALL: Turn East on Hwy 558 to the town of Crane and base. Ask guard for directions to the campground. Active, National Guard, Reservists, Retired, 100% DAV. DoD Civilians, NSWC civilians. None. No cell phone access. 30 day stay limit, but may be extended another 30 days based on availability. Higher prices are for DoD civilians. Pop-ups, small trailers and truck campers can also use the tent sites. Perfect for a quiet get-away in the woods. Campground is stuck way down in an isolated area of Base. Sites are crowded and close together. During weekends all gates except one are closed making it a 24 mile drive to nearest town. Commissary is small but stocked with necessities unless you need them in a Sunday or Monday when it’s closed. Won’t be coming back! We have stayed in military campgrounds from coast to coast but this is the first one that I plan never to return. 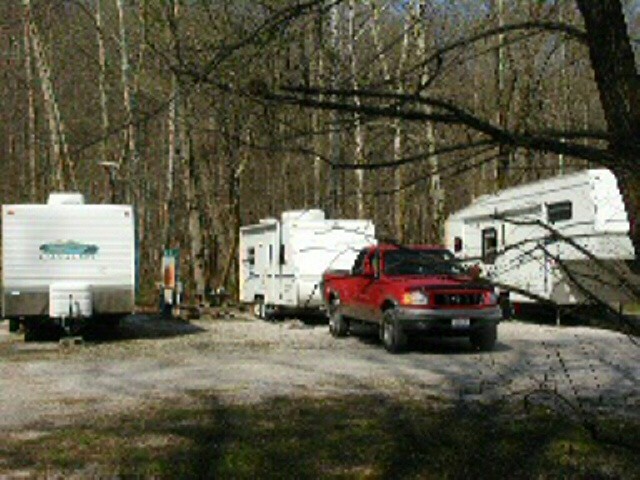 The campground is located about 5-6 miles inside the base gate down a narrow steep road. The facility is basically a gravel lot with hookups. Our pull thru site was just barely long enough for our 5th wheel, was not level and very close to the rv next door. We could get absolutely no cell service with two major providers, no tv channels with the antenna or satellite. There are no “amenities”. It is located just a short walk from the lake but that just doesn’t help all the negatives. The base is extremely large in land size but very few building or activity. Small post exchange and commissary. Staff at lodge where we checked in was very friendly and gate guard was really helpful. Spent one night, due to no wifi, no cell service AT&T, Sprint, or Verizon, and no over the air TV channels. The base is very spread out and about mile and half from main base road down to the campground on the lake. 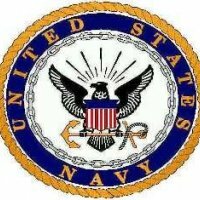 You check in at the Navy Inn about 2 plus miles away from the campground and the Inn dose have wifi. Be aware that there is a small commissary that will fill most campers needs. The staff at the Inn was very helpful and understanding about only staying one night. Great place to relax. Fresh gravel and leveling. Bath house clean and neat. Laundry was free and convenient. Small commissary and exchange but they have everything you need without driving miles to the next town. VFW just outside of Crane gate had great food, and welcomes anyone if you want to eat, if you want drinks must have membership card. Great fishing at Lake Greenwood! Marina opening weekend was same weekend as our stay Staff was friendly! Hope you enjoy your stay just as much as my family and I did. This is the second time I have visited this camp and I am planning on returning soon. I like it when people have negative things to say... mostly for selfish reasons to keep it from becoming over-crowded. LOL Someone saying this isn't big rig friendly couldn't be more inaccurate - most spots are pull thru with AMPLE room. the RV area is gravel so there isn't a lot of grass around. The sewer system is a bit odd because the campground used to have TWO separate sewer systems but one has been closed due to problems, it just takes a second to survey the RV site to align any rig. Basically the RV area was cut in half and takes a second to figure out. The staff is fantastic - friendly and helpful. Although the shower house is dated it was always very clean and free washers/dryers. If you want to be on your cell, computer or TV all day this place may not be for you but if you like nature this camp is fantastic. There is a shoppette, good Commissary with gas station and the Hotel/check-in has free wifi with good connectivity, but about 5 miles from campground. Great marina with boat rentals and great fish cleaning station. Wildlife and great well-marked hiking trails abound. Reservation staff is helpful and more than willing to let people change sites when available. I will be back but hopefully this gem stays hidden to those looking to actually camp in nature. Not impressed! FamCamp area tough to find if after hours. Brush needed trimmed back, no concept on how to align sewer hook-ups and electrical poles. My sewer connection was under my trailer! Big rig friendly? Slots on far end of entrance are extremely tight (all back-ins), if rigs and pull vehicles are more than 40 ft total. Pull thru's work best in front part near laundry room and showers. Over-nighter need to unhook so as to not block driveway. Free laundry btw, 2 ea washer/dryer. Neighboring campers were nice though! No cell or internet connection, but that is advertised. Surrounded by high hillsides surrounding area will do that to you. Come back? No thanks! In late June, the campground was flooding out during a rainstorm and work on repairing the damage was completed this week. They brought in rock and leveled the sites of the campground. They did a fantastic job and it looks great. Extended stay prices are great! Various rentals at the marina with reasonable prices and very nice employees. Lots of wildlife to see. We really enjoyed our stay and was very happy with the campsite. 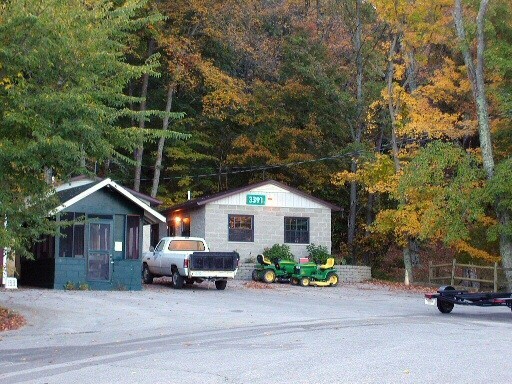 Stayed at this campsite near the end of the season. 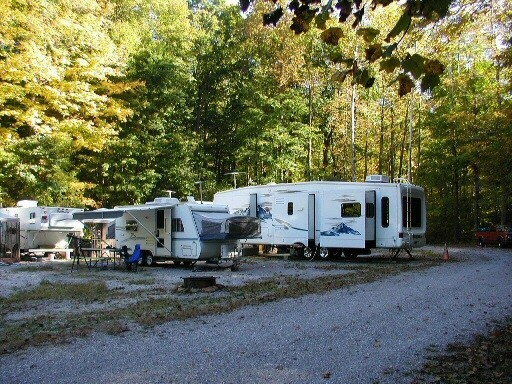 If you enjoy rustic than you will enjoy this campground. There is a small bathhouse which was clean and well maintained. Free laundry consisted of two washers and dryers. 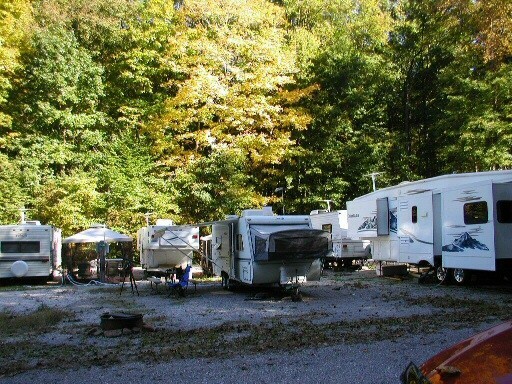 The campsites are all pull-thru, full hook-ups with 30 & 50A. The fall season was beautiful and miles of well marked hiking trails. Although closed for the season the nearby marina was nice with rental equipment which appeared to range from paddle boats to kayaks and possibly motorboats available for rental. There is a LOT of local wildlife which came right into the camping area. Both people and deer, coyotes and bobcats surprised each other so pay attention. Downside: If you want more than nature you may be disappointed, lots of mosquitoes, very poor cell reception, leveling can take some effort, it is a long drive to local small towns. Upside: beautiful lake and hiking trails, small but well stocked commissary, decent Shopette, gas station. Overall: this is a gem that I almost don't want to share -- I will be back. Okay, so we were a bit skeptical about this trip since there have been no recent reviews for this campground. We were out there just this past weekend (July 6-8). The cabins are small, but they work. 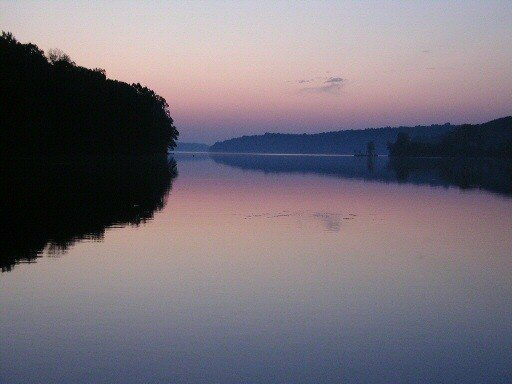 The lake is absolutely beautiful and very quiet. It wasn't crowded, it was perfect. I guess the best way to describe the area is rustic, but if you are looking for a nice quiet get away and you don't mind tight quarters, you will LOVE this place. 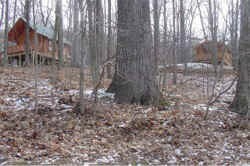 The cabins and camp areas are kept nice and clean. Bring games, the cabins don't have TVs and cell phone service is practically non-existent. 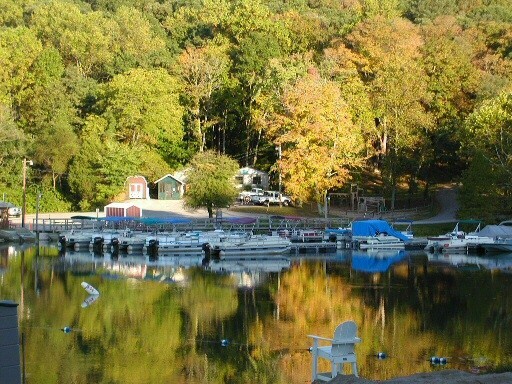 Beautiful campground nestled in a valley beside Lake Greenwood. 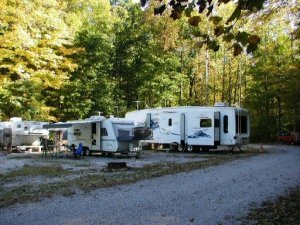 The campground amenities include a full bathhouse, free laundry facilities, and fire rings. There is a small sand beach on the lake for swimming at your own risk. Boat/Paddleboat rentals are also available. Fishing is excellent and a small bait shop is open daily. Definitely a hiker's paradise with plenty of room to roam. Plenty of firewood available nearby in the woods from fallen trees. Campground cleanliness was impeccable. The base has a small (4-lane) bowling alley, tennis and basketball courts, and an excellent fitness center. A small PX and commissary is open with limited hours, usually closing at 1600 during the week and also closed on weekends. There is a cafeteria and a Subway located on base. Nearest notable towns for off-base entertainment include Bedford to the east, Jasper to the south, and Bloomington to the north. Each is approximately a 30-40 mile drive. Highly recommend Stoll's family restaurant, features buffet style Amish home-cooking, excellent desserts, and a beautiful lakeside dining atmosphere. The restaurant is about 12 miles south on Hwy 231. Drawbacks are only lack of cellphone and TV reception. I did receive an acceptable signal from CBS in Terre Haute. Highly recommend you bring plenty of entertainment if you're not a fisherman or a hiker. Don't leave anything edible outside at night because you will be visited by the forest bandits, and be especially careful driving. Deer roam rampant throughout the base. B.S. left this review: My wife and I recently spent a night at the Crane facility; it is a beautiful site with gravel lots, all pull-thru with 30 and 50 amp service, water & sewer. It is next to a 700 a lake and in the boondocks! No firearms allowed on station and the on station facilities appear to be limited. ( we got there after everything had secured for the day) At $19.00 a nite I was satisfied. Saw numerous deer which could be a hazard. Check in is at the CBQ some distance from the campground. We have Cingular wireless and couldn't connect at the site. My family and I stayed in Cabin #1. The wooded area is beautiful. 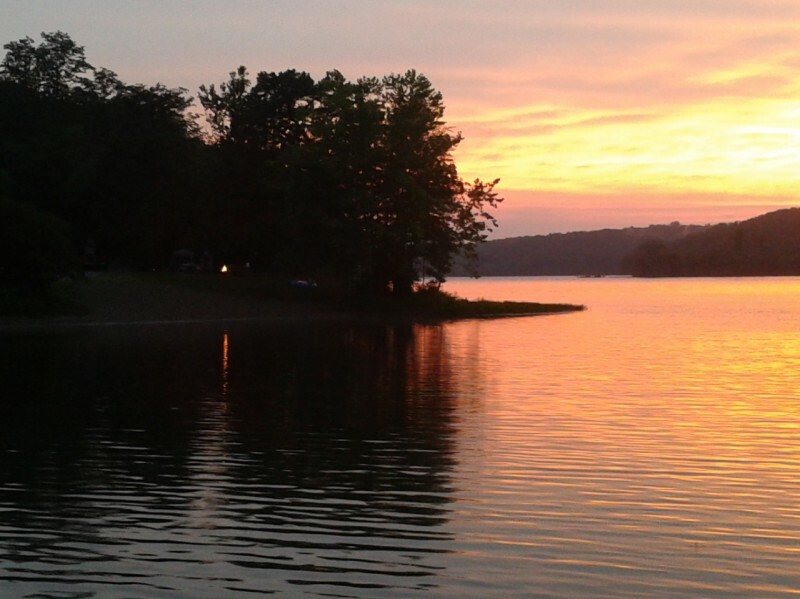 There are numerous trails, boats for rental on Lake Greenwood, and a Gym with Tennis Courts and Bowling Alley nearby. Matresses and futons are provided, but linens (if you don't bring your own) are available for an extra charge. Prices went up this year, making this less of a value, but the cabin we stayed in was nice, clean, well-maintained and easy to access. There was plenty of fallen trees from a storm last winter, so we didn't need to buy or bring any of our own firewood and every evening we had a wonderful fire. There is a fire ring (for a campfire) and a grill (for charcoal) at each cabin. Reservations and Check-in is handled at the Combined Batchelor's Quarters (CBQ). Area around cabins was clean. Very beautiful, clean, and quiet wooded area. Compared to past reviews, a lot of work must've been done. All sites are gravel and pull-through except for a few tent sites which are grass and very large. Electric hookups are all 50-amp, so if you need 30-amp service you'll have to bring an adapter. The bath house was clean and recently painted. Staff was very friendly and helpful. Stayed for a couple of days last fall. Outstanding location, quiet, and beautiful. The campgrounds were in serious need of repair/upkeep. Weeds and abandoned belongings were everywhere. Looked like a shantytown. The facilities building (showers/laundry) needs to be demolished and rebuilt. The Base Commander had served notice to all the homesteaders, to vacate the campground of their campers, decks/gazebos, and stacks of firewood. It would not take much to make this one of the best campground around. Need to find motivated Camp Host, with the support of the command, to pull it together. Hope that it has turned around. Really liked the location. Gravel sites in a extremely wooded area. They were building a new building for the marina and fixing the docks in dec 2005. There is Lakeview Conference Center for places to eat on base. It is best to get your food before 4 pm, most places close before then. Make sure you go to Shull's Lakeview restarant which is west and south of the base in a town called Lagootee This base is great to get close to nature! 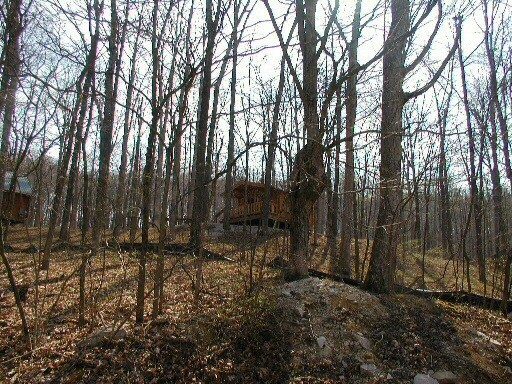 huge base that is wooded and has many back roads for scenic drives. Look out for deer on roads! 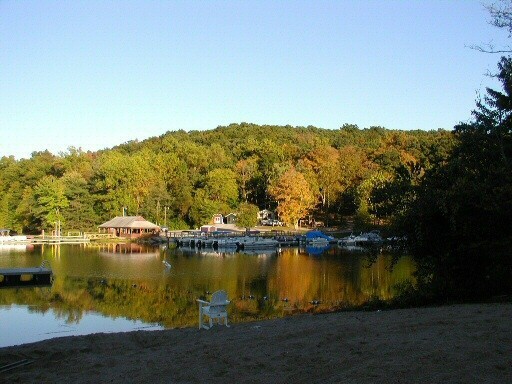 800 acre lake, pontoon and jonboat rentals. Friendly people at office and basically all over the base! Fairly close to Bloomington Indiana for Indiana University games or Indianapolis.